Because this stitch pattern is staggered, you will start the pattern on the second stitch of the second row, and the fourth stitch of the fourth row. You will also have two extra stitches at the end of each fourth row. All the stitches, not in pattern, are just knit. I didn't realize how striped this pattern would look, in the two colors. I don't particularly like it. However, done in a multi and a solid (that is a color in the multi), I think it would look fantastic. There isn't much, if any, drape. The stars create tiny holes, so it's not as dense as you might expect. * Note - Depending on the amount of stitches used, you will either add additional knit stitches to the end of the second or fourth rows (see chart). For anyone who would like a PDF of any of the stitches posted, please either leave a comment here, with the name of the stitch and your email, or contact me through a private message on Ravelry.com, where I am also Weasiesworks. 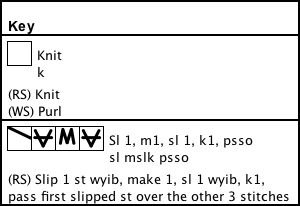 I have gone over these charts and written patterns a number of times, but no one is infallible, so please leave a comment referring to the stitch pattern and any error you might find. Also, feel free to ask questions. I can always try to answer them. The book, that I'm translating from, is 40 years old. I'm not only finding some wrong information (like a pattern that looks nothing like the drawing), but also I'm noticing that the author was lacking in a few knitting skills, because often she's made bad stitch choices. For example, whereas most of us would know that the opposite of ssk is k2tog, she will use only k2tog, which isn't always the best look. There were no actual photographs. They paid someone to draw out each pattern (incredibly time consuming). This journey is kind of fun, kind of frustrating. I'm posting this information, because I just realized today that the Acorn Stitch is not the Acorn Stitch I find in Internet searches. It is the "Textured" Acorn Stitch. I don't know what the Basket Stitch, that I posted is called nowadays. I haven't been able to locate it anywhere. 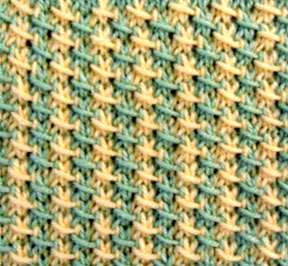 It's not the Basket Stitch most commonly used today. So, if anyone reading the patterns realizes that one or more of the stitches is known by a different name, please leave a comment. It's a quick fix. I am entering my 70's this year, but I don't really think I'm old. However my body does feel old at times. I'm enjoying retirement as it leaves me the freedom to pursue all kinds of activities on any given day. I have to keep busy with my hands, mind or both. This is just my nature. I love to learn new things, and love to design and change other's designs to suit my needs. I'm not a joiner. I'm more of a loner though I enjoy all the time I get to spend with family and friends. I just think I need my alone time more than most people. Perhaps because my mind is always thinking of new ideas and I can't do that with constant interruptions. I love passing on information and skills I have learned through the years.